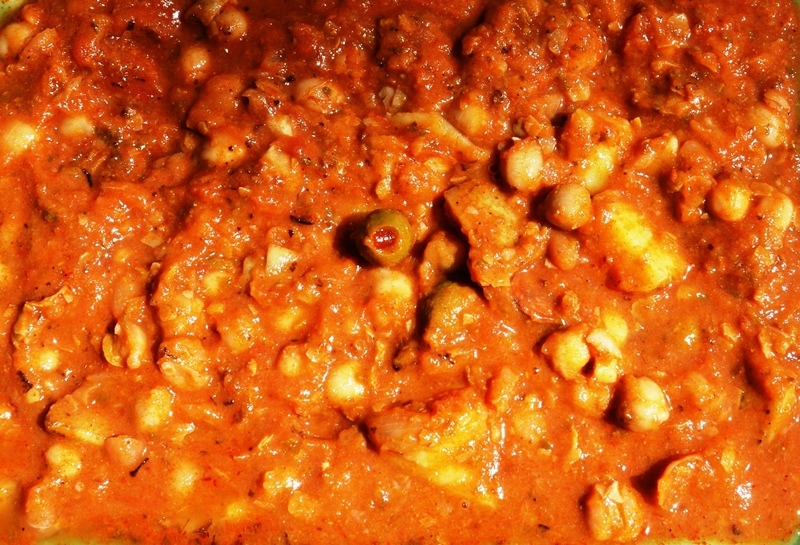 I love garbanzos (chickpeas), they are extremely versatile, and of course delicious. For a fast meal, with little fuss, these can be whipped up in the time it takes to prepare a pot of rice, in the rice cooker. In a large skillet, fry bacon, sausage, or ham, add onions, and then garlic, stirring, and being careful not to burn garlic or onions. After about five minutes, add tomato sauce, sugar, olive, oregano, cumin, and coriander, and cook for about five more minutes, then add chickpeas, wine, and water. Bring to a boil, and add salt and pepper, reduce heat and let them simmer for about 20 minutes, adding more water if needed. This same base can be added to make a wonderful soup or potaje. The first time I tasted it was when my Father made it for me, and it was truly memorable. He started by boiling ham hocks, to which he added fresh chickpeas that had already been softened; along with two to three diced potatoes and about one cup of pumpkin. Add the sofrito, and let it simmer until the vegetables are tender. You could also add a cup of shredded cabbage, though I do not, as he did not. Serve it in soup bowls, and drizzle a little olive oil on the top. This entry was posted on January 15, 2019 at 12:01 am and is filed under Food, SlideShow, Uncategorized. You can follow any responses to this entry through the RSS 2.0 feed.